> Several outlets have reported late this week that Miami commit Shane Berschbach will no longer be heading to Oxford and will instead join former Indiana Ice front-man Jeff Blashill at Western Michigan University in Kalamazoo. 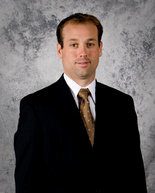 Berschbach, who signed a National Letter of Intent at Miami in 2008, played under Blashill in Indiana for the past two seasons and will be a part of his first ever recruiting class. The Clawson, Michigan native registered 79 points (32 G, 47 A) during his time in the USHL and is considered to be undersized, standing 5’8 and weighing 140 lbs. You’ll recall that Blashill, a Miami assistant from 2002-2008 was hired as the new Broncos’ head coach in May, after Jim Culhane was removed as the bench boss with one year remaining on his contract and will spend the final year as a fundraiser for intercollegiate athletics, the University has said. The Miami RedHawks, last year’s national runners-up, ranked #1 for the majority of this season, the runaway winners of the CCHA regular season title, champions of the NCAA Midwest Regional and the NCAA Tournament’s top overall seed are back in the Frozen Four. Standing in their way in tomorrow night’s national semifinal, however, is a name all too familiar to Miami hockey fans, players and alumni: Boston. Whether it’s followed by “University,” as it was in last year’s national championship game, or “College,” as it was in 2006, 2007 and 2008, it has meant the same thing – loss. In some cases as in 2008 and 2009, it meant heartbreaking loss. As Miami’s program has continued to improve, the past six years have returned remarkable success. Consider two things: Miami has the best winning percentage in college hockey since 2005-06. Additionally, since 2007-08, Miami has spent more time atop the college hockey polls than any other school but they are just 1-4 against Boston College/University during those years with the one victory coming over BU at the now defunct Lefty McFadden Tournament in Dayton back in 2004. And, tomorrow’s opponent, Boston College, knocked the RedHawks out of the national tournament three consecutive years. In 2006, Miami captured just its second ever CCHA regular season title and was ranked number one during the regular season for the first time in school history. However, they would fall in the CCHA Championship game dropping the RedHawks from a #1 to a #2 seed setting up the first of three consecutive meetings with the Eagles. This one coming in the first round. A broken stick and two empty net goals led BC to a 5-0 blanking of Miami. BC earned a trip to the Frozen Four, but lost in the national championship game to Wisconsin. In 2007, Miami eeked out an at-large berth and #4 seed drawing New Hampshire in the first round. Led by junior captain Ryan Jones and classmate Nathan Davis, the RedHawks upset UNH earning the school’s first-ever NCAA Tournament victory. Awaiting in the regional final? BC. Once again, the Eagles shut out the RedHawks breaking open a close game late and winning 4-0. With the victory over Miami, BC earned another trip to the Frozen Four, but fell in the national title game to Michigan State. In 2008, Miami finished the regular season and CCHA Tournament 32-7-1 garnering a #1 seed in the national tournament. In the first round, Miami found themselves in a dogfight with all-world netminder Andrew Volkening and Air Force. After defeating the Falcons in overtime, they found themselves face to face with nemesis Boston College. Again. This time, Miami would take a 2-0 lead in the second period, but on the strength of three quick, consecutive goals, BC led 3-2 entering the final period. Senior captain Ryan Jones tied the game at three, but a fluke goal during overtime by current BC junior Joe Whitney sent the Eagles to their third consecutive Frozen Four. This time, they would not be denied winning the national title by defeating upstart Notre Dame in the final. That said, seeing Boston College on the docket standing between Miami and a return trip to the national championship game isn’t all that surprising. The Eagles started slowly but have gone 17-4-1 over their last 22 games finishing 27-10-3 and are currently riding an 11 game unbeaten streak. But, BC has been incredibly lax defensively surrendering 14 goals over the past three games which will be a killer against a Miami team that is number one in the nation in team defense and ranked in the top 10 offensively. On the flip side, the Eagles can score. They rank second nationally in team offense and have potted 19 goals over those past three games winning each of them including a wild 9-7 win over Yale in the Northeast Region final. Boston College appears to be a small team, compared to Miami, with one line that encompasses nearly 40% of their scoring. The Eagles are led by the line of Cam Atkinson (27 goals), Brian Gibbons (16) and Joe Whitney (16). However, none of the three are taller than 5’8″ and Whitney is just 5’6″. What does that mean? It means Miami’s big, and mobile, defense should have a field day clearing pucks, punishing BC forwards and should dominate this game. You have to believe the CCHA’s Defensive Player of the Year and Columbus Blue Jackets’ draft pick, Will Weber (6’4″, 225) is licking his chops considering the size differential. Weber and his defense partner, Joe Hartman (6’4″, 200), comprise Miami’s top defensive pairing. And, with Vincent LoVerde likely still out of the lineup due to injury, you can expect this pair plus Cameron Schilling (6’2″, 185) and Steve Spinell (6’1″, 200) to see quite a bit of ice time versus the diminutive, but speedy, Eagles. In net, Miami and BC have experienced netminders to choose from. BC’s John Muse backstopped the Eagles to the national title in 2008 as a freshman and of course, Miami’s Cody Reichard took the RedHawks to within a heartbeat of the title last year while Connor Knapp made 55 saves in the 3-2 double overtime Midwest Regional final victory over Michigan just under two weeks ago. Muse, however, has been shaky as of late. While the Eagles are no fluke, their defense and goaltending have been abysmal, and you can’t count on scoring five goals in a game like this. Defense and goaltending win championships and Miami has a distinct advantage in both categories. Like the Michigan game, Miami must defeat a team that’s become their nemesis. If they want to become a truly elite program, these are the teams, in these situations, that the RedHawks must knock off to exorcise their past failures. In a sense it’s a revenge game for Miami. Considering BC has beaten them three consecutive times in the tournament, you’d think Miami will be more than up for this game and playing with something to prove. They desperately want to beat a team with the word “Boston” on the front of their sweaters. – Miami broadcasting “legend,” Steve Baker (he’ll love that, trust me) has been hard at work in Detroit, covering the RedHawks’ first day in the Motor City. Check out the links for the Miami press conference and a recap of day one festivities. The official Frozen Four documentary will be sponsored by Reebok and is being created with the full support of the NCAA. The crew has been shooting since Monday, and will continue through Sunday. The current plan has the documentary not only covering game footage, but the back story of one player per team. The Rival Films Facebook page has pictures and behind the scenes info from the Frozen Four and their taping this week. In addition, the Facebook page has a trivia contest ongoing up until Saturday’s championship game, with Reebok prizes for winners. The DVD is available for pre-order here at a significant discount from the retail price, including free shipping. DVDs will ship close to June 15th. – For those that missed it, The Pipeline Show has a blog recap of the Frozen Four Coaches’ Edition, featuring Enrico Blasi. You can read about the episode, or listen to it by clicking this link. 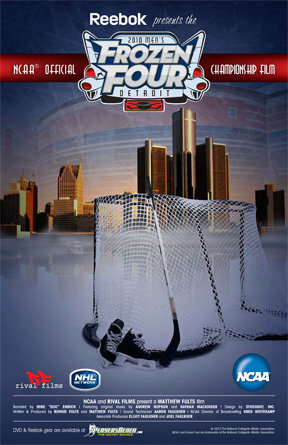 – If you’re looking for a good read, check out this piece from “Let’s Play Hockey”. It’s a great look at just how many college-“honed” players are currently in the NHL today. Astounding, actually, when most players seem to come from the Canadian junior leagues. Good stuff and great pub for college hockey. – College Hockey News has a nice feature about the RedHawks goaltending dilemma. There are some great quotes from Rico (comparing choosing a goaltender to selecting a Pope-priceless) and more! – And whatever you do, please find time to watch the video of Pat Cannone at this link from ESPN. It shows just how long the players’ walk from the Ford Field ice to the dressing room is. It’s uphill and upstairs.